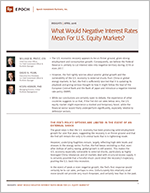 What Would Negative Interest Rates Mean for U.S. Equity Markets - Epoch Investment Partners, Inc. The U.S. economic recovery appears to be on firmer ground, given strong employment and consumption growth. Consequently, we believe the Federal Reserve is unlikely to cut interest rates into negative territory during 2016 or even 2017. However, the Fed rightly worries about anemic global growth and the vulnerability of the U.S. economy to external shocks from China or global energy markets. In fact, the Fed is sufficiently worried that it is updating its playbook and giving serious thought to how it might follow the lead of the European Central Bank and the Bank of Japan and introduce a negative interest rate policy (NIRP). While our conclusions are certainly open to debate, the experience of other countries suggests to us that, if the Fed did cut rates below zero, the U.S. equity market might experience a modest and temporary boost, while the financial sector would likely underperform significantly, especially relative to defensive sectors. The good news is that the U.S. economy has been producing solid employment growth for over five years, suggesting the recovery is on firmer ground and that the Fed will remain the only G10 central bank that is in tightening mode. However, underlying fragilities remain, largely reflecting high debt levels and stresses in the energy sector. Further, the Fed keeps reminding us that, even after dollops of policy easing, global growth is still anemic. This makes the U.S. economy especially vulnerable to external shocks, particularly as highly leveraged China rebalances and oil markets deal with structural excess supply. It is certainly possible that a forceful shock could derail the recovery’s trajectory, pushing the U.S. back into recession. In the event of weak or even negative growth, the Fed’s first response would certainly be to cut rates, perhaps to zero. Unfortunately this relatively small move would not provide very much firepower, and certainly less than in the past. For comparison, the Fed cut by 6.75ppts in 1989–1992, 5.5 ppts in 2001–2003 and by 5.0 ppts in 2007–2008. Today the best it could do would be less than 0.4 ppts; small beer indeed. Next, the Fed could turn to forward guidance (that is, attempting to lower and flatten the yield curve by using “open mouth operations” to convince markets that they will refrain from hiking for a “considerable period”). However, the curve is already quite flat and Yellen’s term as chair expires in February 2018, implying that such an approach would lack credibility. Third, the Fed could resume quantitative easing, a policy it employed from late-2008 until October 2014. However, this policy has become quite controversial and politically charged. Further, given how low yields already are, QE would almost certainly be less effective if tried again. Does this mean the Fed has already used up the whole nine yards and is now helplessly out of ammo? Given the limitations of the “conventional” policy options discussed above, the Fed has come to the realization that it needs to add more arrows to its quiver. As a result, it has been carefully analyzing the pros and cons of negative interest rates and has even incorporated NIRP into its 2016 stress tests (which banks needed to submit by April 5; results to be released in early June). This raises the question of how NIRP would work in practice if the Fed decided to go down this route. Conventionally, the Fed affects interest rates through its open market operations, but with NIRP a second channel becomes more important — specifically, the interest rate it sets on the reserves that commercial banks hold at the Fed. (These reserves make a potent target because, as a direct result of the Fed’s QE policies, they have increased 370-fold since 2008, to today’s mind-boggling $2,497bn.) In normal conditions banks are paid a positive interest rate for these reserves. However, in the topsy-turvy world of NIRP, instead of receiving interest on their reserves, banks are taxed with a negative rate — that is, they are effectively charged a fee for maintaining reserves at the central bank. Although certainly unconventional, the intent of NIRP is similar to that of other approaches to easing monetary policy. That is, to incentivize banks and other market participants to shift out of deposits and other low-risk assets, moving further out the yield curve and into higher-risk investments. The hope is this will further flatten yield curves and boost asset markets and, with luck, this will encourage animal spirits and result in a robust recovery in investment and consumption. Well, at least that is the theory. Unfortunately, the evidence from the countries that have already experimented with NIRP isn’t terribly encouraging. Outside of the U.S., negative interest rates are increasingly being viewed as a conventional policy tool. Indeed, over $6 trillion worth of government bonds already have negative nominal yields and the number of countries with negative rates is likely to increase even further (Figure 1). Many commentators are skeptical that such policies will work as advertised. And their doubts appear justified given the lack of evidence so far that NIRP is having a positive impact on employment and inflation in the big economies of Europe and Japan. Additionally, we would like to examine the impact of NIRP announcements on equity markets, so that we have a better understanding of what to expect in the event that the Fed ends up following the ECB and BOJ’s lead. Denmark was the first central bank to adopt a negative interest rate policy. 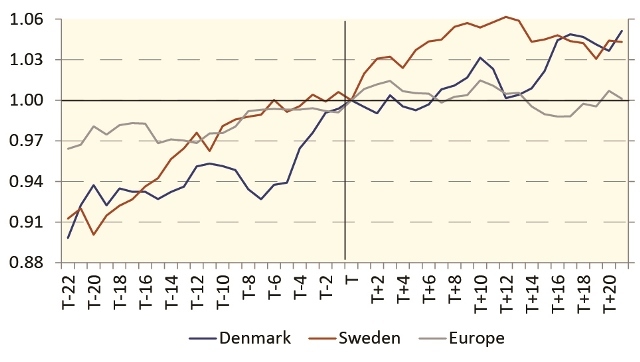 The announcement occurred on July 5, 2012, although the behavior of Danish equity markets suggests it was well signaled. The local stock market increased by an impressive 10% in the pre-announcement month and by a further 5% afterwards (Figure 2). The market reaction was similar when Sweden’s policy was announced in early 2015. Equity markets in Denmark and Sweden cheered loudly when their central banks announced negative rates, but the European response was more muted. It appears that after the Danish experience markets became more cynical regarding the efficacy of negative interest rates and realized that central banks would only introduce such unconventional policies if the macro environment was deeply challenging. To illustrate, European equity markets increased by a modest 3% during the month prior to the ECB’s move to negative rates on June 5, 2014 and then traded directionless afterward. We haven’t included Switzerland’s experience here because its NIRP announcement was closely followed by the central bank’s decision to depeg the CHF from the EUR, a move that sent domestic equity markets into a nose-dive. Similarly, Japan isn’t included because the BOJ exhibited puzzling timing by announcing its new policy on January 29, 2016, in the middle of a 10% sell-off in global equities. All risk assets globally were being aggressively sold during this period, so it is hard to draw any lesson’s from Japan’s experience. In light of the varied and disparate experiences discussed above, it is difficult to make strong predictions regarding how U.S. equity markets would react to a NIRP announcement by the Fed. However, we believe the European experience offers the most likely guide. This is because the two economies are of similar size and because the Fed and ECB are widely viewed as the two most influential central banks. Consequently, we would expect a modest equity market rise of, say, 3% in the run-up to a NIRP announcement by the Fed, with little influence on trading afterward. 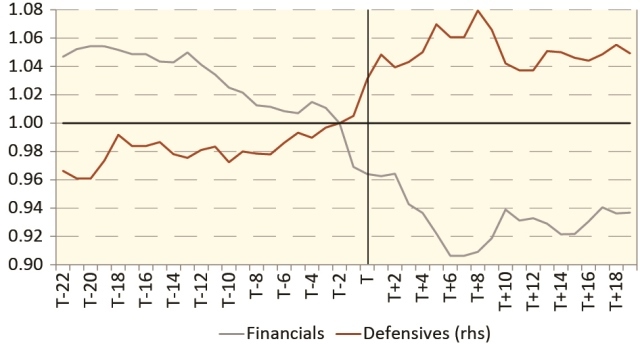 We now examine relative sector performance following NIRP announcements by the ECB and BOJ and find that financials underperform, while defensive sectors tend to do quite well. However, we don’t provide sector-level results for Denmark, Sweden and Switzerland because their markets are too small to provide generalizable results. Financials underperformed following Europe’s NIRP announcement, especially against defensive sectors. The reaction to the BOJ’s NIRP announcement on January 29, 2016 was quite similar. 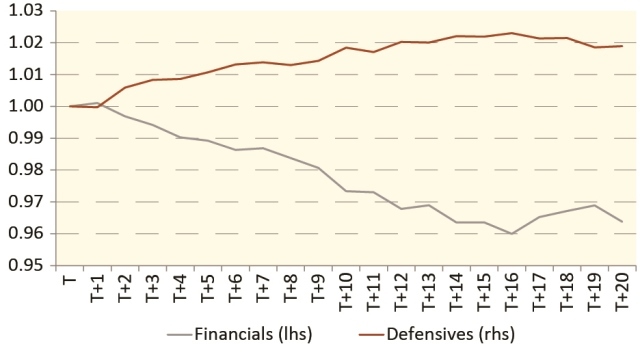 During the following 20 trading days the financial sector underperformed the Topix index by around 6% (at one point it was down almost 10%), while defensive sectors outperformed by around 5% (Figure 4). This reaction was similar to the European experience. Indeed, when we also examined the month before the announcement it appears that investors anticipated the BOJ’s move and possibly learned from price action in Europe, as financials underperformed by 5%, while defensives outperformed by 3%. Similarly, financials in Japan also underperformed following the BOJ’s NIRP announcement. The poor performance of banking sectors around NIRP announcements is driven by expectations that net interest margins will get squeezed, as funding costs don’t fall enough to fully offset lower interest income, with deposit-heavy banks particularly exposed. Given that household deposit rates will probably remain sticky around the ‘zero bound’ (i.e., banks will find it difficult to charge for deposits), the margin squeeze is unlikely to be just a temporary headwind for bank performance. Figure 5 illustrates how awful European bank sector performance has been, and not just in response to NIRP announcements but, more broadly, an environment characterized by interest rates declining toward and beyond zero. Since the ECB first introduced its NIRP there has been a 92% correlation between relative bank performance and European interest rates. In fact, banks have underperformed the Euro Stoxx index by a staggering 26% since NIRP was introduced on June 5, 2014. 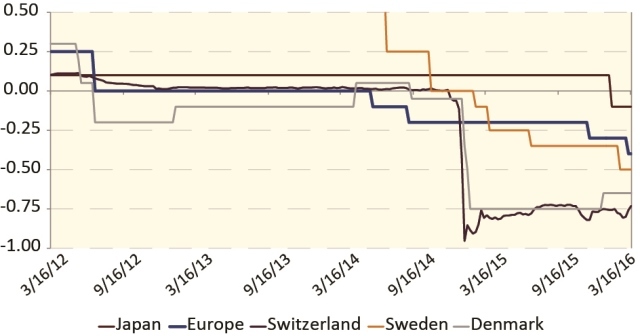 Declining interest rates have led to dramatic underperformance by European banks. And bank underperformance isn’t just a European phenomenon. Since mid-2015 the corresponding chart for Japan has exhibited a correlation of 94%, with banks underperforming the Topix by 7% since the BOJ’s announcement earlier this year and by 22% since the ECB’s announcement in mid-2014. Further, since mid-2015 the U.S. banking sector has underperformed by over 15%, moving in line with the declining trend in U.S. interest rates (the correlation of 91% is very similar to that in Japan and Europe). The evidence is clear that Europe and Japan’s negative interest rates comprise a major headwind for banks’ margins, earnings and stock market performance. Indeed, the Bank for International Settlements (the so-called ‘central bank for central banks’) has warned about “the debilitating impact of persistently negative interest rates on the profitability of the banking sector.” This poses a huge problem for policymakers, particularly if it prevents banks from lending normally. There are two additional points we would like to make. First, even when faced with a gusty headwind of low and declining interest rates, some banks will be attractive and outperform. We are particularly interested in banks that exhibit “self-help” capabilities (i.e., are restructuring proactively and allocating cash efficiently in response to the dynamic and challenging environment they face). Second, there are important differences between U.S. and European banks. For example, the former are generally less dependent on deposits for funding, so they may find their net interest margins under somewhat less severe pressure than their European counterparts. 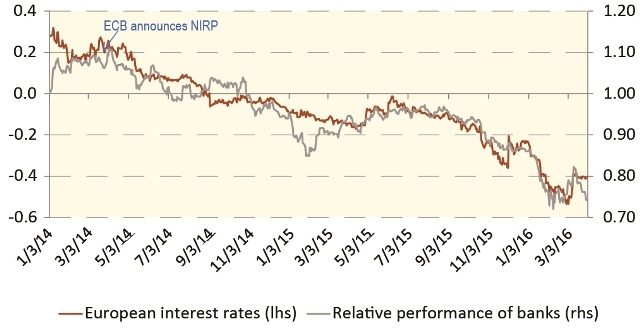 How Would U.S. Markets Likely React if the Fed Announced a NIRP? To be clear, we believe the U.S. economic recovery is on firmer ground (albeit, still overleveraged and unbalanced) and that the Fed is unlikely to cut in the near future. However, if an external shock pushed the U.S. back into recession, the Fed might well introduce a NIRP, which could lead to the U.S. equity market benefiting modestly (say, by 3%), while the banking sector underperformed significantly, especially relative to defensive sectors. To illustrate, many external experts estimate that bank earnings would be reduced by 5% to 10% if the Fed were to cut policy rates to -25bps. A challenging environment for banks indeed.